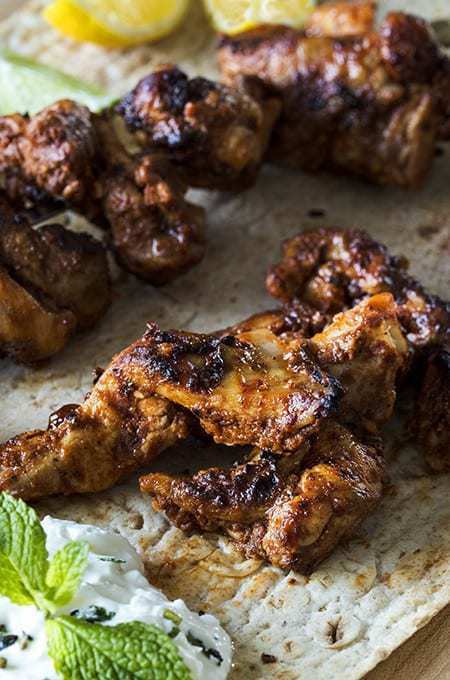 These delicious little bites of chicken are a lovely Turkish dish called Tavuk Shish and guess what? They’re low carb, keto, and just perfect for the Air Fryer. Tavuk Shish is actually a chicken kabab, but I’m lazy/efficient so I don’t bother to use skewers when I make this in my Air Fryer. Rest assured, this still tastes fantastic, even without the sticks in the middle. You could serve as little pieces of chicken, or you could “reverse skewer”, as I like to call it, and put it on skewer sticks after it’s been cooked. They look like kababs, but I don’t have to touch raw chicken long enough to skewer it. Win win! 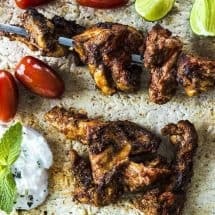 If you like kebabs, I have several amazing kebab recipes! Check them all out HERE! The marinade can technically be done in thirty minutes, but it can be left up to 24 hours for a full flavor infusion. The easiest way to do would be to put it in the night before and let it marinate overnight. The spice combination in this dish is incredible and you will want to taste every bit of it! So typically you’d eat Tavuk Shish in a sandwich, or with rice. This differs a little by region and personal preference. I like to serve it with tzatziki and/or hummus and I’ve started using Joseph's pita bread which is both low carb and delicious. I’ve provided an Amazon affiliate link for the bread, but it’s a LOT cheaper at Walmart so I’d try that first to see if your local store has it. 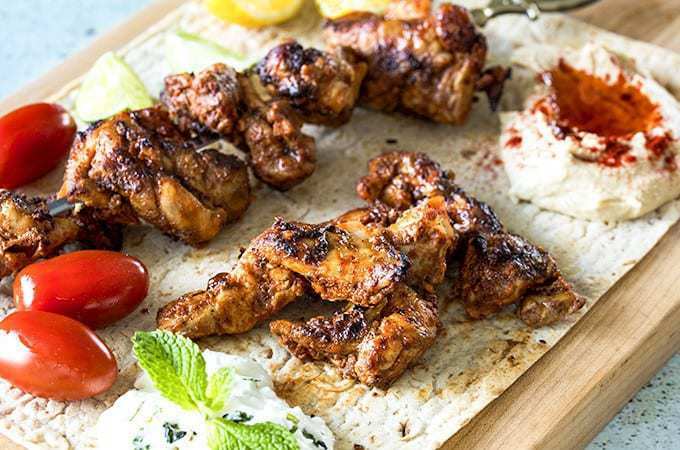 Tavuk shish is actually a chicken kebab but I’m lazy/efficient so I don’t bother to use skewers when I make this in my air fryer. Rest assured, this still tastes fantastic even with the missing sticks in the middle. You could serve as pieces of chicken, or you could ͞reverse skewer͟ as I like to call it—which is to skewer the cooked pieces of chicken onto cute little skewers. They look like kababs but I don’t have to touch raw chicken long enough to have to skewer it. Win win! In a large bowl, stir together the Greek yogurt, garlic, tomato paste, lemon juice, oil, salt, cumin, paprika, cinnamon, black pepper, and cayenne pepper until the spices are well-blended into the yogurt. Add the chicken pieces and mix until the chicken is well-coated with the marinade. Allow the chicken to marinate for 30 minutes or for up to 24 hours in the refrigerator. Remove the chicken from the marinade and place in single layer in the air fryer basket. Set the air fryer to 370ºF and cook the chicken for 10 minutes. Open the air fryer and flip over the chicken. Set the air fryer to 370ºF and cook the chicken for another 5 minutes. You mentioned an air fryer accessory kit or a 7 inch pan in the utensils area. But then never referred to using it with in the directions. Just to put chicken pieces in the air fryer basket. Just wondering what the best technique is. This was delicious! I was a little hesitant about using the cinnamon, but it was just a hint in the background. Marinated the full 24 hours. Still getting used to my air fryer so I think I overcooked a bit but the chicken was still wonderfully moist. Thank you, Urvashi, for another great recipe. How would you adapt for chicken breasts? That’s all I have in the fridge right now! This is a great recipe! I grilled it bc I don’t have an air fryer, but it is unbelievably tasty! Urvashi, you haven’t steered us wrong yet- I’ve only made a few recipes, but French garlic chicken is later this week. My family loves you! Your recipes are simply amazing and mouth watering. One ? If one does not have air fryer @ what temperature does one cook this receipt or any other keto chicken in oven and time? Great recipe. I used metal skewers to get heat into the center of the pieces, and cooked on the grill. Really good! Could I use my rotisserie for this? I could place the meat in the basket.. 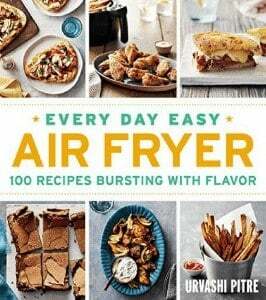 I don’t have an air fryer. How should I cook the chicken? Oven, broiler, pan fry, and outdoor grill are all great options for this.